The post-war transition in Angola has involved small shifts in strategies of elite accumulation to maintain the status quo and deepen the internal concentration of power and wealth. This paper hypothesizes that Angola is at the beginning of a fundamental political-economic shift – away from the peripheral rentier economy and towards an indigenous system of capitalist accumulation. Recent developments in the oil and oil services sectors such as the push for increased local content, or “Angolanisation”, show that the elite is engaged in a process of reinventing itself. Unfortunately, the tendency of the transition is towards the further entrenchment of the power of the Angolan elite and increasingly unequal distribution of wealth under the emerging social relations of production and accumulation. A transição pós-guerra em Angola envolveu pequenas mudanças nas estratégias de acumulação da elite para manter o status quo e aprofundar a concentração interna de poder e riqueza. Este artigo coloca a hipótese de que Angola está no início de uma mudança político-económica fundamental – da economia rentista periférica para um sistema indígena de acumulação capitalista. Desenvolvimentos recentes no sector petrolífero e no sector da prestação de serviços como a pressão para aumentar o conteúdo local (“angolanização”), mostram que a elite está envolvida num processo de reinvenção de si própria. Infelizmente, a tendência da transição é para um maior entrincheiramento do poder da elite angolana e uma crescente desigualdade na distribuição de riqueza sob as relações sociais emergentes de produção e acumulação. 1By almost any measure, Angola is a country undergoing profound change. Today, the juxtaposition of old and new overwhelms visitors to the capital of Luanda, where construction cranes dominate the ever-changing skyline. Advertisements for the Banco de Fomento de Angola (BFA)2, one of the largest banks in Angola, show male and female celebrities perched on an iron girder dangling from a crane high above the city, exhorting passers-by to “Grow with Angola”. 2One of the few constants throughout Angola’s many post-independence upheavals has been the presence of the ruling Movimento Popular de Libertação de Angola (MPLA), which has been under the leadership of President José Eduardo dos Santos since 1979. In fact, the MPLA and its leader have emerged from each successive period of change with a stronger hold on power than before. The structure of Angola’s economy, which is heavily dependent on rents from petroleum, has sustained the system of presidential patronage that has allowed the party and its president to survive. For that reason, despite the double-digit growth of the past decade (interrupted only briefly by the global financial crisis), the structure of the economy has also remained a constant, to the detriment of the average citizen. 3To use the terminology of Samir Amin (1974, 1976) Angola’s economy is only peripherally connected to the global capitalist system. While it imports goods and exports resources, its economy is predominantly non-capitalist in that there has not been widespread proletarianisation. In recent decades, Angola has transitioned from a centrally-planned one-party state to a (nominally) multiparty (quasi) market economy. Steve Kibble (2006) writes that the “politics of disorder” predominated in post-war Angola and suited the Angolan elite as they proclaimed transition for “outside cosmetic purposes” (p. 525). In fact, the near-universal view in the academy, and, at least privately, amongst other Angola-watchers, is that little has changed in the political economy of Angola since Christine Messiant described it in 1992 as a system of “clientelist redistribution” (Messiant, 1992 cited in Hodges, 2004). However, a careful reading of Angola’s various transitions shows that each has involved small shifts in strategies of elite accumulation in order to maintain the status quo, or indeed, to deepen the internal concentration of power and wealth. 4This paper hypothesizes that Angola may be at the beginning of a more fundamental shift in its political economy; away from the peripheral rentier economy that has developed since independence and towards an indigenous system of capitalist accumulation. The paper does not explore the Angolan economy as a whole. Rather, by focusing on recent developments in the oil and oil services sectors, it is argued that the beginnings of a shift from rentierism and more primitive methods of accumulation in the oil industry can now be discerned from an analysis of strategies of elite accumulation. Furthermore, the possibility is very real that this transformation will continue to grow in strength over time given policies of “local content”, or “Angolanisation”. Far from heralding the glorious coming of development under capitalism, the tendency of the transition as it is currently envisioned is towards continued underdevelopment and accumulation by dispossession fuelled by the further entrenchment of the power of the Angolan elite and increasingly unequal distribution of wealth under the emerging social relations of production and accumulation. 5Beginning in the mid-1980s, the ruling MPLA underwent a transition culminating in 1990 with the decision by the Central Committee to end the one-party system and to formally abandon Marxism-Leninism and embrace economic liberalisation. Ferreira (1995) argues that Angola’s petroleum nomenklatura was not quick to embrace such fundamental change. Rather, the politics of rentierism and the elite’s ability to pillage the state allowed them to resist change until it became inevitable. The economic reconversion of the nomenklatura is today almost complete​​: on the ideological and political front, the acceptance of the functioning of a democracy (with limitations) proved not incompatible with the maintenance of its social and economic status. Authoritarianism was not the only possible guarantee of their privileged situation; a market economy proved similarly compatible with the preservation of their privileges (p. 18, author’s translation). 7In what has become perhaps the definitive statement on the political economy of Angola into the post-war transition, Hodges (2004) describes a system where “The rent from oil is used primarily to satisfy elite interests and finance means of retaining power, through expenditure of security and patronage, rather than to promote social and economic development” (p. 203). In this system, patronage flows directly from the top – the Office of the President. President dos Santos uses all the powers of his office to reward loyalty in symbiotic patron-client relationships that are highly toxic to the country. 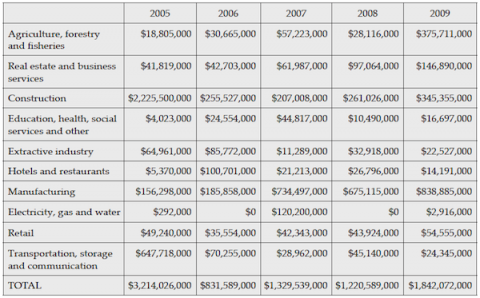 The result, described by Kibble (2006), is a state where few citizens have access to clean water, health, education, public order, justice, energy, and infrastructure. 8There is surprising uniformity in the picture painted of the Angolan elite. Hodges (2004) argues that corruption is “endemic throughout the public administration”, and even takes on some of the language of Marxist political economy when he says that corruption at higher levels is “part of the process of ‘primitive accumulation’ by the politically connected elites” (p. 83). In their 2005 Drivers of Change report, Vines, Shaxson and Rimli (2005) write: “Angola’s economy is strongly controlled by a presidency that wields power through personalised networks which, as in many African and other countries, can be more important than the ministries and other formal institutions” (p. 7). 9Hodges (2004) describes several strategies of direct and indirect elite accumulation used in Angola in the post-Marxist-Leninist period. Indirect appropriation occurs through manipulation of exchange rate policy, interest rates and access to credit. For example, until 1999, the government used privileged access to the administratively-set official exchange rate to enrich the elite and transfer state resources to individual beneficiaries. More direct methods of elite accumulation described by Hodges include privatisation and land reform, as well as base looting of state coffers. Much of this privatisation occurred without proper valuations of the assets or competitive bidding3. Meanwhile, as Hodges notes, many army officers and state officials acquired farms and other businesses as political favours, often for nominal sums or no payment at all, under a large land privatisation programme that began in the early 1990s. 10Finally, Hodges (2004) notes that, over time, restrictions on competition, and the Angolanisation of the economy have become increasingly important strategies of elite accumulation. At the same time, the elite’s incorporation into domestic and international circuits of capital has become increasingly important to their enrichment – particularly as aforementioned strategies, such as the exchange rate policy and allocation of credit, waned. Central to the new strategy is the climate of oligopolistic or monopolistic market conditions created by import procedures, other forms of administrative favouritism, and harassment of businesses by the Polícia Económica. In short, the Sonangol Group has been not only the manager of the Futungo’s phantom revenue flows, but also the enabler of elite rentierism across important non-oil dimensions of the domestic economy, simultaneously guaranteeing that all profitable business opportunities are arbitrated by state rulers via the company (pp. 608-609). 12In 2008, Hodges confirmed that increasingly the elite are relying on their previously accumulated wealth and preferential access to the state to the extent that the patronage system has moved into a phase where some wealthy Angolans who benefited from earlier phases of accumulation (and privatisation) can now take advantage of their ties to the presidency to benefit from the government’s policy of Angolanisation, whereby they can participate directly in the oil industry through the establishment of service companies. Sonangol, in turn, pressures oil operators to contract to these companies. At the same time, he writes that kick-backs on government contracts and the straight diversion of state resources to private individuals and companies continue to be important mechanisms of surplus appropriation, made possible by the general opaqueness of public finances and the secrecy of oil-guaranteed loans. Taken together, it is clear that the literature on Angola does reveal several periods of political-economic change and a process of increasing complexity in strategies of elite accumulation. 13Beginning with the work of Ferreira, scholarship on the accumulation strategies of the Angolan elite shows a remarkable capacity on behalf of the elite to adapt and reinvent themselves as necessary to suit changed geopolitical realities. Today, as the elite reinvent themselves, there is reason to question whether even the opaqueness of public finance, the “Bermuda Triangle” described by Hodges and Kibble, and the notorious oil-backed loans, will remain important constructs for the Angolan elite, who may see greater value in increased international legitimacy4. At the same time, as Angola becomes more important economically and strategically to the West and to China, there may be greater desire to grant that legitimacy despite lingering remnants of the unsavoury past5. 14Olivier Vallée (2008) confirms that recent years have seen more technocratic management of petroleum rent in conjunction with finance capitalism, which he describes as part of the “adaptive spirit of Angolan capitalism” (p. 21). Concluding that “the rentiers in power have not been content to fight for oil money; to capture it and transfer it out of the country”, Vallée writes that there has been a “hybridisation of capital” produced from an “accommodation” of “Afro-Marxism with a disembodied liberal discourse” (pp. 39-46, author’s translation). This is the setting for a new reinvention of the Angolan elite as capitalist entrepreneurs. 15Speaking about the possibility of primitive accumulation leading to capitalism and the makings of an haute bourgeoisie, Soares de Oliveira (2007b) writes: “Reality could not possibly be more different”. He goes on to say definitively: “Elites are focused on ‘rent seeking, not economic activity’” (p. 140, citing Rose-Ackerman, 1999). However, this analysis is premised on the assumption that other sources of income “cannot compete with oil rents” (p. 141). It is precisely on this point that the antinomies of the hypothesized transition will play out. Much will depend on just how altered the political economic context is, not just with the end of the war in 2002, but with a completely different geopolitical moment in the Gulf of Guinea as a whole. Soares de Oliveira writes that “the elite is not a ‘class’ with a constant notion of where ‘its’ interest lies…” (p. 133). However, history has shown a powerful tendency for the elites to gain consciousness (as a class) that capitalist accumulation is preferable to dependence on political patronage and to make a capitalist transition when they are able to do so, and in particular, when it becomes possible to profit more from capitalist accumulation than from rent-seeking activities. 16In The Emergence of African Capitalism, historian John Iliffe (1983) presents three types of regimes that emerged in post-colonial sub-Saharan Africa: “anticapitalist”, “parasitic capitalist”, and “nurture capitalist”. The final category, nurture capitalism, refers to “a deliberate attempt by the state to create an economy in which at least substantial areas of enterprise would be in the hands of private capitalists”. Following Iliffe, Catherine Boone (1998) asks: “Will Africa’s political classes use their power to expand the scope of local capital accumulation, especially by supporting and facilitating local private investment in industry?” Exploring the case of Senegal, Boone suggests that, in light of evidence she collected that in certain cases the political class is willing and able to use state power to promote local capital accumulation and local investment in industry, “arguments to the effect that these social strata are invariably comprador in character can no longer be accepted” (p. 185). 17Noting that her scenario is contingent on “the emergence of a class or part of a class committed to a bourgeois project, the consolidation and effective exercise of its political power, and the existence of a state with the institutional and political capacities needed to promote effectively the interests of nascent indigenous capitalist strata”, Boone writes that in most of Africa, “no significant stratum or fraction of the wealth-accumulating political class invests in productive activities… in these situations, political classes are predominantly ‘rentier’ in nature”. She explains that while indigenising capital accumulation is in the interest of “some” political classes, the political project of consolidating internal political dominance and retaining control over the state apparatus is central in all cases (Boone, 1998, p. 186). Boone’s argument suggests that to find a regime that nurtures capitalist development, there would need to be a consolidated political class and a strong incentive to promote productive activity. 18Of course, patronage can still play an important role in this type of capitalist transformation. In Boone’s work, clientelism is identified as an important feature of rentierism, which is contrasted with indigenising capital accumulation. In the case of Angola, rentierism and the indigenisation of capital accumulation go hand-in-hand, since Angolanisation is, as Hodges notes, an increasingly important mechanism of elite accumulation. To be sure, the indigenous oil services sector, which is the focus of this study, is not yet significant in terms of importance to the Angolan economy, nor to the investment strategies of most elites. However, if local capitalism is to emerge in Angola, there are several reasons that it is more likely to do so in oil services first. 19What follows is a study of the potential of the oil services sector in Angola to transform from rentierism to local capitalism. It must be left for a later project to extend that analysis to the rest of the Angolan economy. One of the key reasons to look first at the oil services sector is that local content in the oil and gas industry is one of the only mechanisms of economic protection with acceptance and legitimacy in the eyes of international capital. Additionally, the oil sector has the potential for many more backward and forward linkages than is commonly understood. These include opportunities to provide business services, rent common and specialized equipment, and produce a wide variety of materials, chemicals, and parts. In many cases, these new business opportunities have the potential to bridge the oil and the non-oil economies and involve more Angolans in capitalist production. This potential is much less present in construction, a sector where it is much more difficult to encourage or protect indigenous companies, let alone diamond extraction, which offers far fewer links to the rest of the economy. Finally, local content can be an internationally acceptable way to promote other sectors of the economy such as telecommunications or banking, as seen in with the November 2011 passage of a law to require international oil companies to use the Angolan banking system to pay Angolan taxes and overseas contractors. 20In theorising an Angolan transition to capitalism, this paper takes the Marxian notion of capitalism as the way in which society organises economic and social production and reproduction. If the Angolan elite are shifting slowly to embrace a capitalist social structure and the capitalist mode of production, this would represent a transformation not only in strategies of elite accumulation, but in the elite themselves; from a rentier elite to what Janet MacGaffey (1987) has called “real capitalists” or what may also be thought of us a real indigenous bourgeoisie (cited in Leys, 1994, p. 25). Of course, it may be a very long time before social relations in Angola are predominantly or even primarily capitalistic in nature. This also depends on the extent to which the transformations in the oil sector described below are also occurring in the economy as a whole. Nevertheless, given the importance of the oil sector to the Angolan economy, the important point is whether or not a significant shift may be occurring or about to occur in that sector. 21Before examining the altered political economic context, it is necessary to review the basics of local content6 in Angola’s oil industry. Local content is significant because it provides a legal basis for facilitating the entry of Angolan companies into the oil industry. In Angola, local content has developed along two separate paths. Angolanisation, which refers primarily to promoting the employment of Angolans in the oil sector, dates back to legislation from the early 1980s7. Today, while the law has been rewritten, Angolanisation remains a project of the Human Resources Department of the Ministry of Petroleum. Meanwhile, encouraging local content in terms of procurement of Angolan goods and services is primarily the responsibility of Sonangol, which exercises a great deal of control over who is awarded contracts from the operating companies. Since 2003, there has been legislation to promote Angolan companies, to reserve some categories of oil services for these companies, and to require foreign companies to work in joint ventures with Angolans in most other categories of services. The best way to develop national content in a country like Angola, or even Nigeria, is by project. You must try and optimize the benefit by project and by the PSA, not by a legal framework covering everything… Legislation doesn’t optimize local content; it just grants it. It can’t enforce, just demand8. 23The manager made clear that modifications to the provisions of the PSA in future bid rounds, along with amendments to existing PSAs, would be the primary method of implementing the new national content strategy. This statement explains why the D.NEG has been the division within Sonangol that has taken over responsibility for local content. However, both the Sonangol manager and an official within the Ministry of Petroleum with responsibility for local content confirmed that there will likely be new laws consolidating and regulating national content9. 24Previous local content efforts have focused on encouraging participation of Angolans in the exploration and production of petroleum; however, these have largely failed due to the complexity and capital-intense nature of this industry. Current efforts are more targeted at the oil services sector. According to data from the Ministry of Petroleum, investment in the Angolan oil sector reached almost US$16.5 billion in 2009 (Ministério dos Petróleos [MINPET], 2010). Capturing more of the capital invested in the sector will lead to significant economic growth and development, particularly if this investment encourages the oil and oil services sectors to serve as an anchor for growth and development of economic activity in related sectors, such as manufacturing and services. It could also create significant employment, a phenomenon not generally associated with petroleum. 25The oil services sector is all but ignored by most economic analyses. For example, in Vines, Shaxson and Rimli (2005), the economy is analysed in three parts: “the non-oil, non-diamond economy”; “the oil sector”; and “the diamond sector”. In the section on the oil economy, there is no mention of oil services. Similarly, in a 2011 United Nations report on industrial development in Africa (United Nations Conference on Trade and Development [UNCTAD], 2011), there was no mention of the potential for development through oil services (which includes manufacturing and heavy industry). Even a recent IMF study on “The Linkage between the Oil and the Non-oil Sectors” (Klein, 2010), failed to mention oil services. 26Local content has been a focus of economic policy throughout sub-Saharan Africa, given the successes of Norway, Brazil and Malaysia. While increased local content seems likely to spur economic development, it is not often analysed in terms of social or political development. Given the context of Angola, local/national content seems equally likely to reinforce the power and wealth of the elite of the MPLA and the high-ups in Sonangol. This concern makes it all the more pressing to question what kind of society this transformation might create given the dynamics of power in Angola. However, before such questions can be asked, the evidence of the transformation must be evaluated. 27The primary evidence used to determine economic growth is data related to Gross Domestic Product (GDP). As mentioned above, GDP growth was booming until the financial crisis hit in 2008. In 2011, The Economist published data showing that Angola had the world’s highest GDP growth rate in the past decade. Although this statistic (and GDP growth rates in general) become less impressive when one examines where Angola was a decade ago, the trend is still important in creating conditions under which a transition could take place. Despite some differences, key estimates and projections for GDP growth in Angola show a return to healthy economic growth, if not the spectacular expansion of 2005-2007. 28More telling perhaps is data obtained from the Angolan Agency for Private Investment (ANIP), which shows steady increases in new private investment by Angolans and foreigners from 2005-2009. 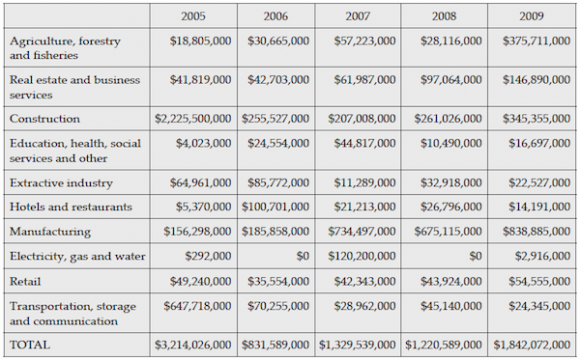 The data is sufficient to show large increases in both domestic and foreign private investment over the past five years (once adjusted for a large spike in construction and in transportation, storage and communication in 2005 – see Table 3)10. 29The data excludes most oil investment, since this investment is made under the terms of the PSAs and also excludes all public investment (including private investment from China under the loan arrangements with China Exim Bank). Some new investment in the oil services sector is captured in the data, although a large portion of this investment also occurs through the PSAs. In the raw data provided by ANIP, some investment in the category of Business Services is specifically tagged as being related to the oil industry. This data is captured in Table 4. The figures represent only a small portion of new investment in oil services; however they do show a significant increase in both foreign and domestic investment. 30Although most foreign companies operating in Angola must register with ANIP (exceptions include companies selling goods and services to the military, companies operating under the China Exim Bank loan, and companies operating in Angola under a PSA), Angolan companies are not required to register with ANIP, unless they are investing with capital that is domiciled abroad. Most Angolans do register with ANIP regardless in order to qualify for a variety of government incentives. 31Taken together, the data shows strong growth in the economy and in investment by both Angolans and foreign investors. However, in the context of Angola, quantitative evidence is only useful to complement what must be shown qualitatively. Therefore, I conducted a series of interviews in Angola with key informants from civil society, government, and the oil industry11. Through interviews and case studies, I intend to show a dynamic and increasingly favourable landscape for the development of capitalist social relations centred in the oil industry. In most countries you see that people that have their own companies, their own businesses, don’t mind saying what they have, how many companies they have—if they have a company, how many workers they have, how much they sell, how much they do. Here in Angola you don’t see anyone telling you that they have a group of companies – how many workers they have, how much taxes they pay. Nobody will tell you that. People tend to do everything very secretly13. 32Since 1990, a particular group of Angolans – generally those with a background in Sonangol – have started up oil exploration and production companies as well as companies providing services to the international oil companies operating in Angola. However, as one such businessman confided to me, Angolan businessmen generally make their money off of trading/export-import businesses and also domestic trading (i.e. buying in Luanda, selling to the provinces). 33Based on his own ethnographic research into the business climate in Angola, Metz (2011) refers to two separate spaces in Angola’s market economy: the “privileged market economy” (for elite and state-owned firms) and “restrained market economy” (for small, medium and micro enterprises). Given this dynamic, it is not surprising that in 2008 the World Bank ranked Angola 168th in the world in terms of ease of doing business. 34According to an economic reporter for one of Angola’s independent newspapers, “In Angola, corruption functions by the connection between politics and business”14. The first Angolan businessman I interviewed described a particularly inhospitable climate for Angolan entrepreneurs in which to supply to the government one must currently be in the government. It is a climate in which it is impossible to compete fairly and in which there is little freedom to enter the market without the right connections. To understand capitalist development in Angola today, you have to see how Europe was two centuries ago… The big families control everything. In Portugal until 1975 that was the case. Few people could really enter into big businesses. Angola is still doing that. It is still trying to create an aristocracy... to have only a few big families, a few big businesses that can support the economy15. 36Obviously, the validity of comparing emerging capitalism in Angola to its emergence in Europe is of limited value given the vast differences in historical context. However, this comparison does show that the emergence of capitalism, far from the rosy picture painted by some enthusiasts, is a messy process. The above-mentioned member of the elite put it well when he admitted: “We are the sons of rich fathers. We are behaving terribly – like spoiled kids”16. 37Paul Kennedy writes: “In a capitalist economy, it might be highly desirable, indeed essential, for long-term national economic development if there was a steady build-up of resources in certain families which did not come to a halt within each generation” (1988, p. 175). While one cannot look at the unregulated nature of economic activity in Angola and compare it to Great Britain during the industrial revolution, what must be established is whether or not Angolans are beginning to take capital, invest it in factors of production, and produce outputs of higher value that allow them to make profit. the belief that there is a fundamental contradiction between continued incorporation of Third World countries into world capitalism and the possibility of industrialization no longer seems as valid as it once did. Thus, some recent writers have argued that metropolitan interests are no longer opposed to development in the periphery and participation in the world capitalist order is not only compatible with industrial transformation but is one of its prerequisites (1988, p. 106, citing Beckman, 1981). 39To establish whether or not there is movement towards capitalist production, it is necessary to determine whether there is any sign that wealthy Angolans are investing more of their money (whether or not it was illicitly accumulated) into the country. It is not necessary to assume that the elite would be doing this because they are no longer solely interested in their own reproduction but in the development of the Angolan economy. To the contrary, the point of this essay is to show how new conjunctural forces bring the goals of the elite more in line with the promotion of nurture capitalism. 40The quantitative data above from ANIP hints at such movement, but cannot present a satisfying case on its own. Soares de Oliveria (2007b) has clearly documented a tendency for the elite to move rents from oil abroad, as have many other authors. However, one prominent Angolan economist responded: “I am convinced this will change in ten years. Angolans will become more interested in investing in our economy rather than investing abroad… We do already have rich people who put their money in agriculture, construction, and manufacturing”17. I believe yes. After the 2002 stabilisation, you can see many more Angolans participating directly in the economy… I wouldn’t be able to tell you the numbers, but when I go around Angola, and I travel a lot, there is a lot more entrepreneurship going on18. 42This statement is generally representative of what most Angolans I spoke with observed. 43Some of the sectors in which there has been local growth, according to Amaral, include insurance and banking. However, Amaral noted that some of this was by imposition and that this growth has occurred despite limitations in the way the system is set up to allow for such investment. Similar to other interviewees, and mirroring Metz’s description of the business climate in Angola as “savage capitalism”, Amaral described this emerging entrepreneurship as “a very wild kind of capitalism”, arguing “We need more rules, but these rules can’t be created on day zero. They have to be created and also implemented. They need to be known around the country – not just in Luanda”19. 44Underscoring the idea that Angola has entered a new moment for both domestic and foreign private investment, a European lawyer who represents some of the most senior members of the president’s inner circle, including family members and members of the cabinet, confirmed that the view of investment in Angola by both his European and Angolan clients is shifting: “It’s no longer a place where you go to get a fast buck out of the country. Now people go to Angola for the long-term”20. This statement demonstrates the same idea or impression that is communicated through the BFA advertisements described at the beginning of this paper: Angola as a dynamic and attractive place for investors. The President has established a special task force within the intelligence services, which selects, distributes and oversees business opportunities for certain political and social figures, reward loyalists, co-opt dissenters, enrich certain families, and ensure a vertical and tight control of the patronage system to maintain the status quo... Furthermore, most of the relevant foreign investments in the country are made through joint ventures with companies owned by the presidential family and the ruling elite, which helps to secure international support and complicity through corruption (pp. 6-7). 46Marques has been at the forefront of exposing official corruption in Angola through his website Maka Angola21. In the summer of 2010, he made an enormous splash by revealing that General Kopelipa, Manuel Vicente (who was then the chief executive of Sonangol), and General Leopoldino Fragoso do Nascimento were the owners of Nazaki Oil and Gáz, which had been awarded stakes in Blocks 9/09 and 21/09, operated by the U.S. company Cobalt International Energy (Marques de Morais, 2010). Cobalt, backed by Goldman Sachs and a partnership between the Carlyle Group and Riverstone Holdings, was subsequently put under investigation in the U.S. by the Securities and Exchange Commission, which handles civil cases, and the Department of Justice, which handles criminal cases (Burgis, 2012). 47After initially refusing to comment, the Angolan government has since changed strategy with regard to the Cobalt case. Vicente, who is now a government minister and has been reported to be the MPLA Vice-Presidential nominee, has admitted co-ownership of Nazaki and claimed his business dealings to be entirely lawful. As Ana Silva (2012) describes: “With the confidence of a man above the law, Vicente suggested that if Cobalt’s dealings with him and his associates were to create further problems, the company should abandon its interests in Angola”. 48What Metz calls the “privileged market economy” is a space in which the Angolan elite engage in unfettered primitive accumulation. The move to disguise elite enrichment as adoption of the “free” market sends mixed signals about emergent capitalism in Angola. In the case of Nazaki Oil and Gáz, there is zero benefit to Angolan participation beyond the benefit to the bank accounts of the company’s principle shareholders. Those shareholders are simply rent-seekers, not capitalists. No productive activity resulted from Angolan participation, nor were any Angolan jobs created. However, in the oil services sector, there are signs that local content can have a positive impact on the Angolan economy. 49The most effective way to collect data on whether or not any kind of transformation is occurring in strategies of elite accumulation, or to detect change or potential change in modes of production in Angola, is to paint a picture of the sector through case studies. Case selection was at least partially done on the basis of opportunities presented. Overall, the evidence of movement towards domestic capitalist accumulation through the production of value through secondary economic activity in oil exploration and production (as opposed to accumulation through rent-seeking), is mixed. As one informant warned, there is a world of difference between greater investment and greater “productive” investment. Additionally, while the cases below show some level of dynamism and a clear desire to engage in capitalist accumulation, the process is still at a very early stage, with many companies expressing little more than an intention to change their business model. At the same time, examples persist of companies set up by Angolans with little interest in moving beyond rent seeking behaviour. 50Of the eight cases summarised in Table 5, the first three are Angolan oil exploration and production (E&P) companies22. There are few companies in the E&P business, and they are all quite small. Companies in E&P generally fall under one of two categories. On the one hand, some are looking to build their knowledge, experience and capacity to be able to undertake more activities themselves. Such companies are actively seeking to make a profit from working in the sector and operating small ventures – generally onshore or in shallow water since this is much less capital intensive. There are only one or two private domestic E&P companies in Angola that would fall into this category. On the other hand, there are companies set up by powerful members of the elite without experience in the oil sector (as opposed to the companies attempting to build capacity, which are set up by powerful members of the elite with a background in the sector). As in the case of Nazaki Oil and Gáz, these Angolans are looking to profit from small holdings in deep offshore blocks operated by others that they have accessed through their political connections and hope to profit from the rents accruing. There are over a dozen such companies in Angola, though many are now dormant. Most are very opaque. They are, as one informant quipped, little more than bank accounts. In truth, not only have these companies been unproductive, they have also largely been unprofitable because the people running them lack appreciation of the complexity and volatility of the international oil industry. 51Given the lack of publicly available information, it was initially very difficult to learn anything about the ownership of these companies. However, by the end of my research I had gathered some information from sources about the ownership of most of them. In most cases, though I could not get enough information to verify or prove what one or two sources were telling me, I feel that that information I collected on ownership has offered me a glimpse into ownership patterns and political connections in the Angolan domestic oil and gas industry. Additionally, the case studies show that while there may be some potential for local content to promote greater national participation in the oil services sector, there has been very little actual value production to date. 23 See for example Marques de Morais (2010) or Global Witness (2009). 52Some information has come into the public domain through courageous investigations that suggest that the owners were close associates of the president, current members of the civil or military arms of government, or current Sonangol officials23. As case studies, there is little to say about the companies that are just bank accounts in the name of a general or cabinet member close to the president. For the Government of Angola, these local “front” companies can generate negative publicity and sometimes great embarrassment when their ownership is revealed. Given their general lack of returns to their owners, it seems unlikely that such companies will persist. Additionally, the international oil industry is concerned that such companies tend not to pay their share of costs or participate in block management meetings. Of greater importance to the international oil companies, association with illicit companies connected to current government officials creates a risk of prosecution for violations of anti-corruption legislation in many Western countries. 53Company 1 was set up by an Angolan engineer with a background in government, Sonangol, and the IOCs24. Intending to become a successful entrepreneur and make profit out of oil operations in Angola, he devotes himself to the business full time. Acting as Chief Executive Officer (CEO), its founder nevertheless has a minority interest in the company. It is probably the only private Angolan E&P company that is serious about being successful from a business standpoint. Although the company and its CEO are well known, the company does not have a website nor has its contact information been made public. 54The greatest difficulty the company faces is access to capital. According to the company’s CEO, “[My company] is not going well. We are up to our necks. Oil production is a game for foreign companies. These conditions have to be adapted for us to survive”25. The problem, according to him, is that his company has to grow on its profits. Not only does it not have great access to capital, but it pays the same taxes and signature bonuses as foreign companies. However, unlike foreign companies, it cannot deduct costs in any other jurisdiction (office expenses, interest on loans, etc.) from its Angolan taxes. In his interview, the CEO stated his belief that Angolan companies must get preferential terms in order to survive and that promoting Angolan E&P companies should be a government priority. 55Company 1’s staff is almost exclusively Angolan, with several engineers that have experience in multinational companies. According to one senior engineer, there are few opportunities for Angolans in upper management, which is why he chose to move to Company 1. He complained that the major international operators are biased against Angolan companies and do not trust them. The senior engineer has actually begun registering his own company, which will offer supply boats and provide some semi-skilled services such as reservoir engineering and production logging in order to take advantage of new policies promoting local content26. The conduct of Company 1 and the other entrepreneurial activities of its highly qualified and professional staff show the dynamism and potential for Angolans to contribute meaningfully to the oil sector if given better opportunities to do so. 56Company 2 enjoys much more direct support from the government and Sonangol. It is widely known in the industry that the company was set up by a former Minister of Petroleum, although formal ownership on paper rests with a variety of Angolans. According to two separate sources I interviewed, ownership may currently include high-ranking officials in the Ministry. Although the former minister is not involved in day-to-day operations, at the time the company won its first concessions, he was still in charge of the Ministry of Petroleum, which would expose several major international oil companies to anti-corruption charges in Europe and North America if his role in the company could ever be proven publicly. 57The full ownership of the company is not publically known, and is said to be spread among numerous high-ranking Angolan officials. Company 2’s contact is more publically available than most companies in Angola. Although it is well supported by Sonangol (some informants claimed that it has received special concessions from Sonangol, which also acts as concessionaire for Angolan oil blocks), it is being managed in a professional way by individuals with the necessary experience and technical backgrounds and seems to be interested in business success. The motivation for this interest may largely be to show the industry that a private Angolan E&P company can be well-managed and successful. Although I was unable to confirm details with senior management despite several requests for an interview and visits to their offices, it seemed to me that several of the employees in their head office are foreigners. 58The company has also experienced problems raising capital and competing as equals with the multinationals, and has therefore advocated preferred treatment for Angolan companies. An Angolan oil insider told me that he saw nothing wrong with the fact that the company was protected and receiving special treatment from Sonangol in Sonangol’s role as concessionaire. The real disgrace, he argued, is that this is done “under the table” and without admitting it. The insider argued that there is a mentality in Angola that prevents Sonangol and the government from offering support and favourable conditions to all Angolan oil companies in a transparent fashion27. While Company 2 is another professional and reputable Angolan oil company, this case also demonstrates how the promotion of indigenous companies in the oil sector has not been separated from the opaque and questionable accumulation strategies of the Angolan elite. 59Company 3 was set up by a group of Angolans, all former senior officials in Sonangol or the Ministry of Petroleum, although none have been in their positions recently. It has invested in a small share of a few offshore blocks but has not yet seen a return. The ownership of the company is not public, nor is the company’s contact information. The director of the company, who is also its largest shareholder, told me that he felt pressured by the government and Sonangol to invest in these blocks because they want more Angolan E&P companies participating in the sector. He claims to have had no interest in forming an E&P company because he knows enough about the industry to know the difficulties in making them profitable. Instead, he had wanted to concentrate exclusively on oil services28. Without state pressure, even this group of knowledgeable and experienced Angolans would not have chosen to invest in offshore oil. 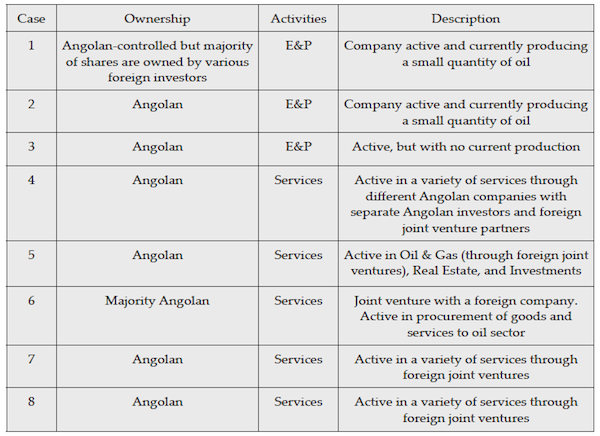 This example demonstrates the complexities of offshore oil production for Angolan companies (especially without open and equal state assistance). If Angolans with technical and business experience don’t want to invest the upstream sector and wealthy but inexperienced rent-seeking members of the Angolan elite are losing money on their upstream investments, the focus of local content efforts should be on promoting Angolanisation of the workforce and more Angolan content in procurement of goods and services. 60Company 4, is the first of the five case studies of oil service companies. In general, while obtaining capital is still an issue for oil service companies in Angola (especially ones offering highly technical or complex services or services based on proprietary technology), the problems faced by Angolan E&P companies do not affect oil services to the same extent because E&P – even for onshore extraction – is significantly more capital-intensive. Company 4 is a group of mostly successful Angolan oil service companies controlled by an Angolan businessman and former Sonangol official. He started each company with different Angolan investors, capitalizing on his unique set of experience, training and connections. The investors are all well off individual Angolans. None of the various company offices have published contact information. The founder of the companies observes: “Most of the people have been involved in training, more than anything else. Probably it is the biggest business in this country. Producing is something different”29. In terms of Angolan businesses currently producing goods and services of value in the oil services sector, he correctly identifies his company as one of a select few. 61The individual behind Company 4 has been operating several of his businesses for many years and has excellent reputation in the industry. With the recent local content push, he has found many new opportunities for joint ventures with foreign firms – in which he offers a valuable contribution as an active partner. He has been successful in the hostile business climate of Angola because he offers quality specialised services for which there is little or no domestic competition. Unfortunately, as he attempts to expand, he is meeting with resistance from Sonangol, which even tried to block one of his new joint ventures and force the multinational he was working with to choose a different Angolan partner. 62In his companies, the individual behind Company 4 tries to employ mostly Angolans. Driving this is a philosophy that: “The oil sector should not be an island that takes everything from outside and puts everything outside”30. Due to his contacts with the international oil companies, he meets their staff, and sometimes when he identifies a particularly bright or capable person, he tries to hire them away, a practice that illustrates the shortage of skilled engineers in Angola. Today, this individual is part of a group of senior experienced Angolans trying to form a new company to offer integrated services to oil operators. In this way, he is continuing, along with a core of Angolans with high-level experience in the industry, many of whom left Sonangol around the same time at the close of the 1980s, to push new boundaries and be successful capitalists. 63By contrast, Company 5 was the case that exemplified the worst aspects of the Angolan business climate. The company is an Angolan enterprise with three core businesses: real estate, oil and gas, and investments (including commercial businesses and agricultural projects). Most prominently, the company is involved in the joint venture between Sonangol and a major multinational oil service company. Its role in oil and gas, however, is simply to facilitate and invest in joint ventures (as a broker) and take a share of the new company. As one of the Executive Directors of the company (there is one for each of the three core businesses) made clear, they do not really even work directly in oil and gas. When I pointed out to the Executive Director that all three of its areas of business – real estate, investments, and oil and gas – activities in which the company is earning rent instead of engaging in production, he laughed and then agreed, without responding further31. 64It is an open secret that Company 5 is favoured by Sonangol, which is why foreign companies looking for an easy entry into Angola seek it out. The company’s Executive Director frankly admitted that Sonangol often tells multinational companies wanting to enter Angola to contact his company because it is trusted32. There are even rumours in Angola that the CEO of Sonangol is behind the company. While there is little credible evidence to support this, I did find that there are strong family connections between Sonangol executives and the executives involved in Company 533. Acknowledging its good relationship, the Executive Director was deliberately vague in explaining how he maintained these good ties, at one point laughing when pressed and saying I had asked a very difficult question. 65Another concern is that the majority of the company’s employees are foreigners (although they should not in theory be able to get so many work permits). According to the Executive Director, most of the staff is comprised of Indians, Brazilians, Portuguese, and some other Western Europeans. In his words, “We don’t have Angolan people with the background to work with us”. The director went on to say that he thought most Angolans were lazy and didn’t want to work34. 66Despite all the criticisms, what is notable about this case is the lengths the company takes to appear professional and reputable, as demonstrated by its office, its very well designed website, and its sleek promotional material. Its office address and contact information are available online, along with a summary of its major activities. It seems that this company is a new version of a company following an old model of business in Angola. The company takes advantage of personal relationships with state officials to find business opportunities where it does not have to make any meaningful contribution other than to act as a front and is therefore not moving towards any kind of value production as opposed to rent-seeking. 67Company 6 is an Angolan company in a joint venture with a foreign oil service company. There are three major shareholders. The international company is a minority shareholder, while the Angolan managing director and a former Angolan Minister of Commerce hold the remaining equity. The address and contact information of the Angolan company is listed on the website of the international company. The Angolan company has one contract – a purchasing contract from Chevron worth $2 million per month. An employee of the company admitted that he thought the company was set up solely to take advantage of the opportunity of the one contract – likely identified by the minister when he was still in office35. 68Another important aspect of this case is the operation of the purchasing contract, which shows several of the limitations of enforced local content. Chevron used to source certain supplies and equipment directly from U.S.-based suppliers. Now, the Angolan partner, Company 6, puts in these orders and the shipments go right from the supplier in the U.S. to Chevron. The company then pays the bill and is reimbursed from the purchasing contract. As a company employee said, “essentially we’re paper pushers”36. 69Despite the nature of the company and Chevron’s questionable involvement in its creation, Company 6 has plans to build its own warehouses and stock the materials Chevron is likely to need, becoming more of an actual supplier and making a genuine (if not significant) economic contribution. It would obviously need to employ people to run the warehouse; however these will likely be the same people Chevron previously employed (at higher wages) to run its warehouses. When asked what benefit the company will have for the country, an employee said “The benefit isn’t huge, but you have to start somewhere”37. No one I spoke to at Company 6 knew of any plans to build factories in Angola to produce any of the materials currently imported from the U.S. Therefore, overall the case is one that demonstrates the limits of forcing IOCs and multinationals to achieve local content by setting up local companies (as opposed to encouraging individuals with real experience and know-how to enter the oil services sector). 70Company 7 is founded by an Angolan former Chevron employee. The founder, who was sent by Chevron to study business in the U.S., is very keen to build a successful company offering important services to the industry. Although the company is starting to be well-known in the sector, it does not have publically available contact information. Company 7 began mostly by offering training services in areas like health and safety, fire prevention, etc. It moved into the provision of labour, which is still its largest business, and has since moved into facility engineering and services, scaffolding, metallic construction, electrical work, mechanical work, drilling, well bore clean-out, fishing, testing, and parts supply and has expanded to all the major port cities in the country. Company 7 works in partnership with a few large multinational companies. According to the operations manager, the company’s goal is to build into more of a conglomerate, working in agriculture, manufacturing and other technical/engineering areas38. This goal shows that they are taking steps towards the goal of producing and creating value. 71The operations manager admitted that connections and contacts are critical for success in Angola, but argued that “you also need the know-how”. His point was that “Once people discover you, you will make lots of money”. The most important thing for getting started is “to be known by Sonangol and the operators”39. The company’s founder and CEO admitted that local content is very political: “You have a company. You may have talent and abilities, but it you don’t have anyone inside of Sonangol or inside the government, you won’t have contracts… so you need to create strong links”. Even if an operator may want to use a particular company, he said, without the contacts in Sonangol that company will likely lose the contract. He complained: “Other companies just go into the business and try and do something that is not contributing much to the growth of the economy”40. 72The company has struggled with the unfair business climate in Angola. Not possessing “protection” within Sonangol, the company’s CEO described how he had been working on a partnership with a foreign scaffolding company until someone at Sonangol decided the partnership should not be with Company 7 and forced the multinational involved to partner with a different, newly-created company41. Nevertheless the company has vigorously pursued new contracts, particularly contracts to work in partnership with multinational oil service companies that hold larger service contracts with the international operators. This strategy has allowed it to expand and, to some extent, prosper. This fact demonstrates that there is some room for a private Angolan company offering services needed by the IOCs to make money without strong Sonangol connections, though it is not clear to me that the company has sworn off the kinds of payments that are so common in all areas of the Angolan economy (see Hodges, 2004; Lopes, 2006). 73The final case similarly demonstrates a positive trend in Angolan oil services. Company 8 is an Angolan company, though it works in a few different joint ventures. It is a fairly large group, conducting business in Europe and the Americas. The company’s aim is to present itself externally as highly professional, similar to any Western corporation. It has a well-designed website with a lot of information as well as a series of policy documents setting out policies on human resources, the company code of conduct, health safety and environmental policies, and an Angolanisation policy, along with its contact information. 74Although Company 8’s promotional material is impressive, a mid-level official in the company admitted that the services they provide the oil industry are mostly in catering and personal protection equipment, although the plan is to expand into engineering and upstream activities. He also confirmed that although no one on the company’s board currently works for Sonangol or the Ministry of Petroleum, most of them used to and entered the sector through those connections42. 75The company’s most important joint ventures are in catering and protection equipment. For the supply of personal protection equipment, Company 8 works with a Brazilian company. All the equipment is manufactured in Brazil by this partner and imported. However, the Angolan company is building a factory in Angola, with the support of the Brazilian company to manufacture the same equipment. Company 8 supplies services to a couple of operators, and also to some of the multinational oil service companies as a subcontractor. In this way, they are expanding and offering increasingly valuable services to the industry. 76Although these case studies provide evidence for and against a change in methods of production and strategies of accumulation, taken together, these cases offer evidence that a shift toward capitalist social relations may be underway. As the shift described above continues, it is possible that more and more Angolans will begin to view value production as more profitable than rent-seeking. It is therefore in the context of a structurally different conjuncture – more than the context of agent-driven decision-making – that this transition is occurring. Although there were intentions among some large and some small companies to engage in increased manufacturing and value production, there remains a great deal of rent-seeking, along with many companies and individuals engaging in questionable behaviour. Over time, if this shift is actually occurring, more Angolan companies will become more involved in new areas of the oil services sector, employing more Angolan labour – both skilled and unskilled. 77As with the favoured local groups in any postcolonial context, the Angolan elite are privileged. What is different, however, is the extent to which the system of presidential patronage, built up over Eduardo dos Santos’ more than thirty years in power, has unparalleled power to reward the Angolan elites with the wealth the country is reaping from its abundant natural resources. The MPLA use the power they already have to attack civil society, limit freedom of speech and expression, and effectively control the print, radio and television media. They are particularly effective at controlling Angolan society. Where they are unable to buy their desired outcome, they have also demonstrated an ability to resort to violence and intimidation. 78Although these case studies provide evidence for and against a change in methods of production and strategies of accumulation, taken together, these cases demonstrate a discernible trend towards a shift to capitalist social relations in the oil services sector. More Angolans are taking seriously the possibility of running successful businesses by offering quality services to the oil sector. Even those hoping to continue accumulating rent from the oil industry are recognising the need for international legitimacy. For this reason, many are preparing to offer higher quality value added products and services in order to continue accumulating wealth instead of using their wealth for conspicuous consumption and/or moving it abroad. It is precisely this combination of transformations that offers the possibility (though not by any means the certainty) of producing positive change in the everyday lives of large numbers of people. 79By way of conclusion, it is necessary to consider what the shift might mean for Angola. Far from advocating entrepreneurship and business friendly developments as beneficial to the country or the majority of its citizens, this paper speaks to historical debates about whether capitalism is a good thing for Africa or a necessary step and contributes new data and understandings of the current conjuncture for oil-producing countries in the Gulf of Guinea. 80In the case of Angola, this paper argues that the current transition seems neither positive nor necessary. The Angolan elite, and in particular the ruling MPLA, are adept at using public power for their own benefit. As Vallée (2008) describes, where the government of Angola has made progress, such as in fighting hyperinflation, it has traditionally “instituted the minimal conditions, little by little, not for the development of the country, but for the functioning of a renewed capitalism, that is still fundamentally rentier-based” (p. 30, author’s translation). 81Rather than a transition for all Angolans, what is occurring is a transition primarily profiting a small group of Angolans connected to the MPLA; rather than representing the development of industry for all Angolans, it is a transformation for a privileged elite – an elite that, as compared to the elite in Europe during its own capitalist transformation, is much more centrally organised and hierarchically structured. 82In response to my research project, economist and opposition politician Justino Pinto de Andrade commented that I could call my research an investigation into capitalist transformation – but that due to the kind of the capitalists emerging in Angola, the result for the country may be more akin to fascism (i.e., capitalism without freedom or democracy). The variety of capitalism articulated by Pinto de Andrade is a potential outcome in which the wielding of virtually unlimited state power by the Angolan elite guarantees a good business climate for individuals connected to the ruling party. Undoubtedly, Angolans can begin to invest in value production without creating a better Angola. The parameters of Angola’s future are being re-structured by a new historical moment for oil production in the Gulf of Guinea. It is therefore in this moment that Angolan agency can shape what that future will be. Amin, S. (1974). Accumulation on a world scale: A critique of the theory of underdevelopment (Vol. 1). New York: Monthly Review Press. Amin, S. (1976). Unequal development: An essay on the social formations of peripheral capitalism. New York: Monthly Review Press. Boone, C. (1998). The making of a rentier class: Wealth accumulation and political control in Senegal. In Lewis, P. (Ed. ), Africa: Dilemmas of development and change. Boulder: Westview Press. Economist Intelligence Unit. (2010). Angola country report. London: EIU. Ferreira, M. E. (1995). La reconversion économique de la nomenklatura pétrolière. Politique Africaine, 57, pp. 11-26. Iliffe, J. (1983). The emergence of African capitalism. Minneapolis: University of Minnesota Press. Hodges, T. (2004). Angola: Anatomy of an oil state. Bloomington: Indiana University Press. Hodges, T. (2008). The economic foundations of the patrimonial state. In Chabal, P., & Vidal, N. (Eds. ), Angola: The weight of history. New York: Columbia University Press. Kennedy, P. T. (1988). African capitalism: The struggle for ascendency. Cambridge University Press. Kibble, S. (2006). Can the politics of disorder become the politics of democratisation and development? Review of African Political Economy, 33 (109), 525-542. Klein, N. (2010). The linkage between the oil and the non-oil sectors – A panel VAR approach. IMF Working Paper. Washington, D.C.: International Monetary Fund. Leys, C. (1994). African capitalists and development: Theoretical questions. In Berman, B., & Leys, C. (Eds. ), African capitalists in African development. Boulder: Lynne Rienner. Lopes, C. (2006). Candongueiros, kinguilas, roboteiros e zungueiros: Uma digressão pela economia informal de Luanda. Lusotopie, 13 (1), 598-642. Metz, F. (2011). The challenging business environment – Experiences of Angolan small and medium sized enterprises. Unpublished Working Paper. Ministério dos Petróleos. (2010). Relatório de actividades do sector petrolífero, referente ao ano de 2009. Luanda: MINPET, Gabinete de Estudos, Planeamento e Estatística. Ovadia, J. S. (2012a). The dual nature of local content in Angola’s oil and gas industry: Development vs. elite accumulation. Journal of Contemporary African Studies, 30 (3), 395-417. Soares de Oliveira, R. (2007a). Business success, Angola-style: Postcolonial politics and the rise of Sonangol. Journal of Modern African Studies, 45 (4), 595-619. Soares de Oliveira, R. (2007b). Oil and politics in the Gulf of Guinea. London: C. Hurst. United Nations Conference on Trade and Development. (2011). Fostering industrial development in Africa in the new global environment. New York: United Nations Industrial Development Organization & UNCTAD. Vallée, O. (2008). Du Palais aux banques: La reproduction élargie du capital indigène en Angola. Politique Africaine, 110, pp. 21-46. Vines, A., Shaxson, N. & Rimli, L. (2005). Angola: Drivers of change: An overview. London: Chatham House. World Bank. (2008). Doing business in 2009: Country profile for Angola. Washington, D.C.: The World Bank. 1 This work was carried out with the aid of a grant from the International Development Research Centre, Ottawa, Canada. Information on the centre is available on the web at http://www.idrc.ca. The author also gratefully acknowledges the support of York University, the York Centre for International and Security Studies and Acção para o Desenvolvimento Rural e Ambiente (ADRA-Angola) in Luanda. He would also like to thank Cara Goldberg and Leah Breslow for their comments and feedback on earlier versions of this paper. 2 BFA is 100% owned by Banco Português de Investimento (BPI). The daughter of the President, Isabel dos Santos, is a significant shareholder in BPI. 3 Privatization during the 1991-1992 period of transition is discussed in greater detail by Ferreira (1995). 4 Like an iceberg, what is known of Angola’s sordid history of state-led appropriation of economic surplus is only the surface. Meaningful efforts to reveal this history include Global Witness (2002). Although such efforts continue (see Global Witness, 2011), the damage done to Angola’s reputation seems to be far less severe. 5 Some recent developments in the Angolan drive to gain international legitimacy include the country obtaining an average B+ sovereign rating with positive outlook from three rating classification agencies in May 2010 (which removes the need to seek oil-backed loans), the negotiation of a stand-by arrangement with the IMF in November 2009, worth an estimated US$1.4bn, moves to publish more data related to the economy and the oil sector (despite all the limitations described by Global Witness, 2011), and the passage of the Law on Public Probity in 2010 (despite its many flaws). 6 In Angola, the terms “local content”, “national content”, and “Angolanisation” are used interchangeably, though the change in terminology from the former to the latter has served the political purposes of the Angolan state. 7 For more background on the history of the Angolan oil industry with reference to local content policy, see Ovadia (2012a). A useful comparison with Nigeria can be found in Ovadia (2012b). 10 Although not covered by the data, it was reported in June 2011 that private investment through ANIP grew again in 2010 – see AngolaPress (2011). 11 The research was conducted from May to September of 2010 as part of my dissertation fieldwork. A total of fifty-nine (59) separate open-ended interviews were conducted with sixty-four (64) interview subjects, both Angolans and foreigners. With the exception of one interview conducted by phone with a subject living in Europe, all interviews took place in person in either Luanda or Cabinda. Reflecting the skew in Angolan society and particularly in the industry, 87.5% of the interviewees were male. Key informants were identified using a “snowball” methodology. 12 My position as a white male, foreigner and non-native speaker of Portuguese was both positive and negative for the research. No doubt it had a significant impact on who I was able to speak to and what they said. Therefore, the results reflect a particular standpoint and are framed by the theoretical lens through which I understand them. My standpoint is articulated not to invalidate the evidence, since all qualitative and quantitative data are collected by some person or group with a particular subjective position. Rather, it is to help the reader interpret the evidence and evaluate its explanatory power. 22 For reasons of confidentiality and to protect the interests and well-being of the informants that participated in my research given the climate of secrecy and unfreedom that pervades in Angola, individuals and company names are not identified in the case studies, though they may be identifiable by people familiar with the industry. 24 For the sake of readability, each legal entity described as a case study is referred to as a “Company” even when it represents a variety of formal conglomerates, informal groups of companies and other legal arrangements. 33 The exact family connections were described to me by a trusted source who is a close to one of the directors of the company, who is related to the director of one of Sonangol’s largest subsidiaries. Jesse Salah Ovadia, « The Reinvention of Elite Accumulation in the Angolan Oil Sector: Emergent capitalism in a rentier economy », Cadernos de Estudos Africanos, 25 | 2013, 33-63.